Those of us who pay attention to international markets have come to understand that in growing markets like China, many people access the Internet via mobile alone. The proverbial chicken has come home to roost. 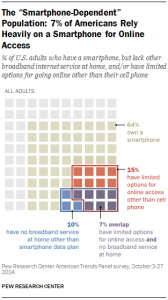 The Pew Internet Project has identified 7% of Americans as smartphone-dependent according to their recent survey. 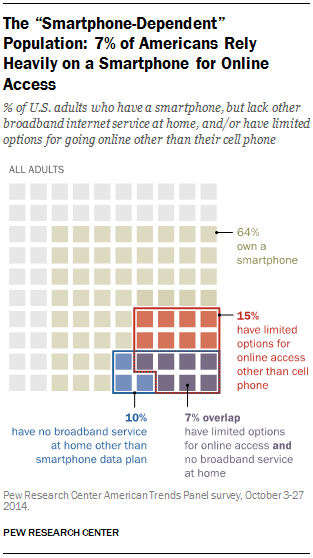 That is, seven of every 100 Americans accesses the Internet via his or her phone and does not have broadband at home or at work or school. These findings have two broad and challenging implications for marketers. This entry was posted in Behind the Numbers, Data and tagged african-american, apps, audience, china, desktop, latino, mobile first, mobile web, pew internet, smartphone on April 1, 2015 by Ben.